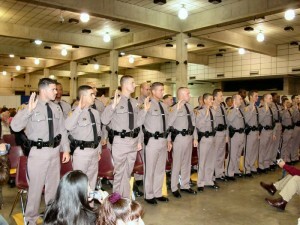 On December 18, 2003, the Florida Highway Patrol Academy graduated its 105th class in a ceremony held at the Tallahassee-Leon County Civic Center. Fred Dickinson, Department of Highway Safety and Motor Vehicles Executive Director, introduced Lt. Governor Toni Jennings as the Commencement Speaker for the occasion. There were 34 graduates, including thirty-one from the 105th BRC (Basic Recruit Class) and three from the Certified Class. These 34 new troopers are a welcome addition, especially since FHP continues to be short-handed because of the retirement of a number of employees earlier this year. Before taking their oaths and receiving their badges, the 105th BRC completed 27 weeks of intensive training, including over 1200 hours of classroom study at the FHP Academy located in Tallahassee. The Certified Recruits completed 8 weeks of training. The troopers now have to complete ten weeks of field training before being released for solo patrol. Florida’s highways will be a little safer with these much needed troopers on the job.